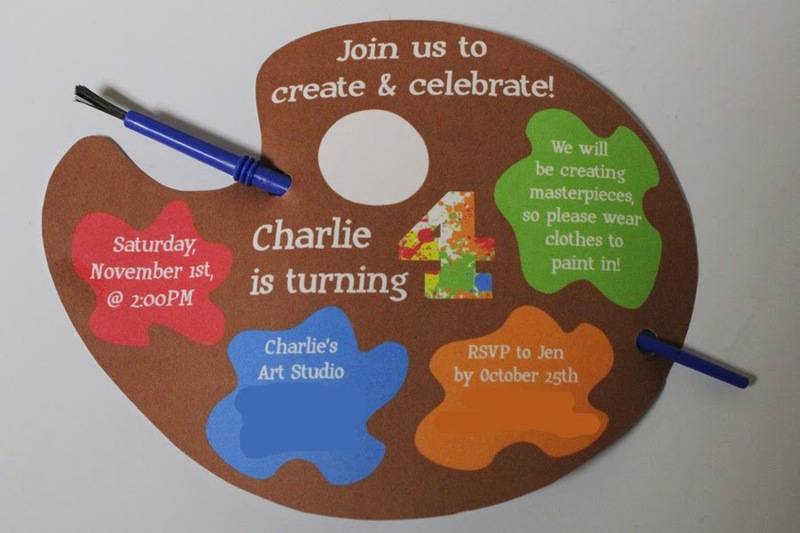 I mentioned a few weeks ago that Charlie requested to "paint with friends" this year for his birthday, so an art party is on the schedule. This will be his first party with little friends from daycare and with their age, it'll also be the first year that we have actual activities vs. throwing a bunch of toys out to keep the toddlers occupied. I did a little googling for inspiration for the invitation. I didn't find exactly what I was looking for, but I had a general idea ahead of time, so that's what I went with; an artist pallet with party info on the paints. I made sure to include a little message about wearing paint clothes - don't want any angry, unprepared parents at this party! Printed on card stock and cut out, I punched two holes and threaded a thin paint brush through. The brushes were $1 for a dozen at WalMart. With invites out, next comes activity and menu planning. I started on the hunt for birthday supplies at the dollar spot in Target. Sometimes they have Crayola themed stuff, but no dice. I headed to Michaels, but even with coupons things were on the expensive side and there wasn't much I wanted to use for decorations. I hadn't been to Hobby Lobby in a long time, so I figured I'd give it a shot. 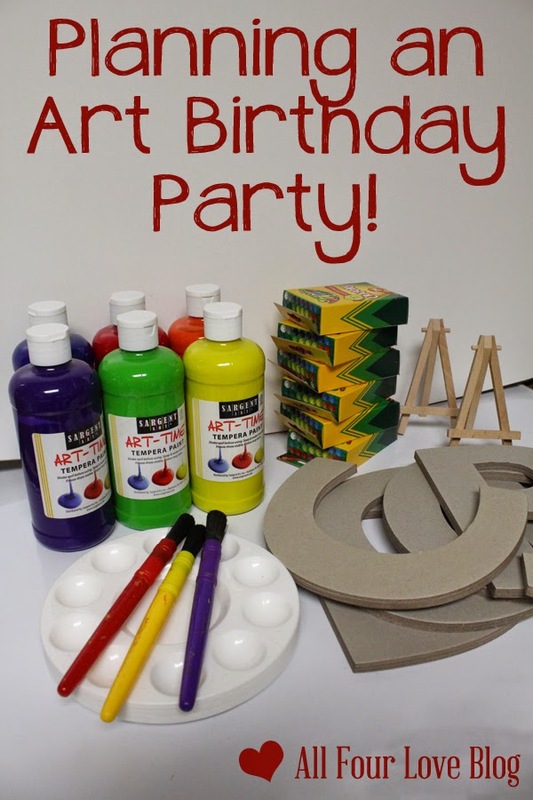 Come to find out that not only did Hobby Lobby have decorations, but they had an entire line of art themed birthday supplies and decorations! Ugh, I love to hate to love you, HL. I scored some tiny easels to mark food and drinks, streamer decorations, punch outs to hang up, cupcake liners, and stickers that look like paint drips. I also found big chip board letters on sale for $1 each for the kids to paint. I bought the first initial for each kid and will just return the letters for whoever cannot come. While we were shopping, Charlie found a chip board music note that he simply fell in love with, so I figured he could test out the tempera paint on it. Not only did the paint stick and spread well on the chip board, but it dried super fast. Perfect! Ginny got in on our little paint experiment too, but mostly just to make a big mess. I also found tempera paint for $1.50 a bottle and small pallet trays to use as "decorate your own cupcake" plates a la Pinterest. All in all, I'm into this party about $40 so far for decorations and activities. 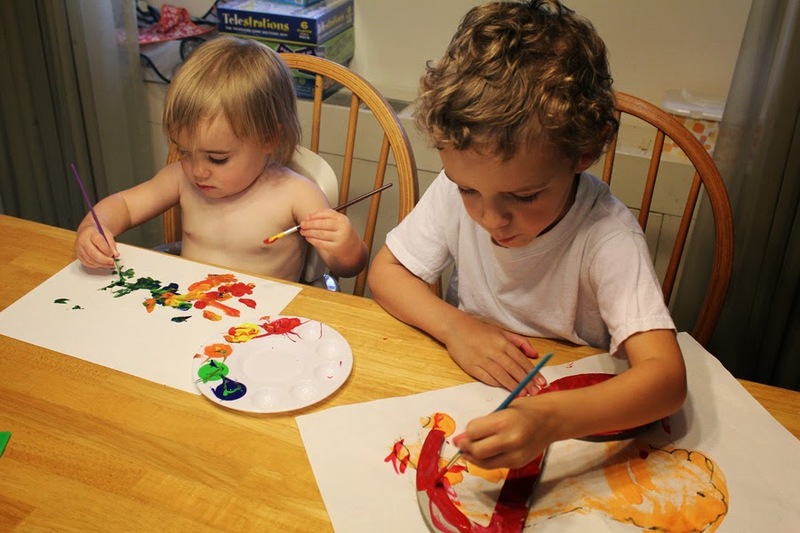 I'm hoping to find child size smocks to personalize for the kids' favor, but so far I have to choose between expensive or poor quality. There has got to be something in between! 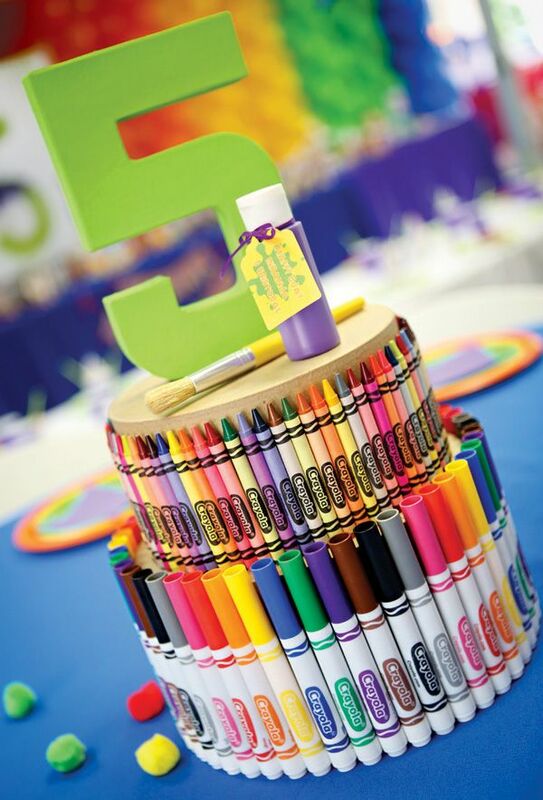 I also hope to make on of these "cakes"with art supplies we already own, cutting down on cost while still making for a really fun centerpiece. As for food, the party is at 2PM, so the food will be light. Veggies, fruit, crackers, cheese, all manners of dips, a few snacky appetizers, a few sweets, and cupcakes for dessert. Voila! I'm a huge fan of ordering party trays from Giant, so that part will be easy and since we're not making a crazy complicated cake this year, I'm anticipating it to be fairly low key. Ya know, aside from the 10 or so four year olds running around with paint! I'm super ridiculously excited for this party and keep finding the coolest stuff on Pinterest. Follow along as I go pin happy! Follow Jen (All Four Love)'s board Charlie's Birthday on Pinterest. While our party planner and her associates were already booked for the date of our event. We corresponded several times with them and could tell they are very organized, friendly, honest and professional. They responded to emails within hours, even on a holiday weekend.